The Top-Longer USB 2.0 S-Video/Composite video Capture Cable lets you connect devices that output S-Video or Composite video to a computer through an available USB 2.0 port. The cable also features two channel RCA stereo audio inputs that let you capture the audio accompanying the S-Video or Composite video signal. The perfect solution for bridging a computer and an S-Video or Composite video source, the capture cable offers real time MPEG 1, MPEG 2 recording. Small enough to fit in the palm of your hand, the Capture Cable is a great solution for mobile applications that integrates seamlessly with laptop and desktop computers. ● Supports NTSC, PAL, and SECAM. ● USB 2.0 transfer rates for high quality video capturing. ● USB powered device - requires no external power adapter. ● HDCP & Analogue Content Protection (ACP) Copyright protection cannot legally be bypassed, and We does not offer any products that do so. ● Convert VHS home movies to digital format. ● Import recorded videos into your computer system for editing and make your own compilation. ● Connect your VCR, camcorder, or any other analog video source to your desktop or notebook PC and capture your audio/video in MPEG 1/2 format. The USB 2.0 S-Video/Composite video Capture Cable lets you connect devices that output S-Video or Composite video to a computer through an available USB 2.0 port. 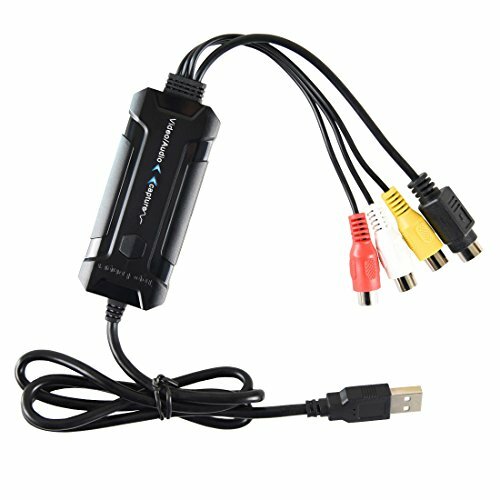 Perfect solution for bridging a computer and an S-Video or Composite video source, the capture cable offers real time MPEG 1, MPEG 2 recording.